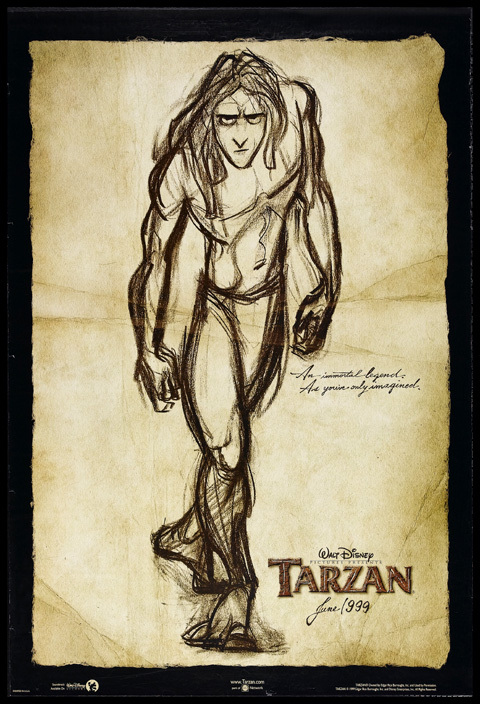  Following in the successful tradition of their "classic" animated films of recent years like Alladin, Hercules & Beauty and the Beast, the Disney studio first began story development of Tarzan in January 1995. In June 1996, experienced Disney animator Glen Keane (Pete's Dragon - 1977; The Little Mermaid - 1989) was approached to animate the principal character. Keane, who was on leave studying in Paris was excited by the project but wanted to use the Paris Disney animation studio, which had done key scenes for The Hunchback of Notre Dame and Hercules. The majority of the other character animation, including Jane, was done in California and Keane and his colleagues transferred their rough drawings back and forward electronically via a computer system called the "scene machine". Keane based a lot of the ape-man's dynamic movements on his son's extreme sports videos and he also endowed Tarzan with the characteristics of numerous animals, including a leopard, snake and baboon. One other new digital innovation was "Deep Canvas", software that allowed the two-dimensional characters to interact with a three-dimensional background in a way never seen before. Composer/drummer Phil Collins was approached to provide songs for the film in mid-1995, in March 1996 a team of key artistic personnel travelled to Africa for two weeks of sightseeing, sketching and photography, and animators attended lectures on animal biology and visited numerous zoos. The recording of the actors voices was accomplished over 1997 and the film was finally released on 18 June 1999. (Green) In 2001 and 2002 Walt Disney Television Animation produced 39 episodes of an animated series based on this film, The Legend of Tarzan, which covered the exploits of Tarzan, Jane and the Professor living in the jungle together following the events of the film.  Kala, a female gorilla whose baby has been killed by a leopard, adopts an orphaned human baby and she resolves to raise him as her own. The baby grows into an energetic and agile youth but he is tormented by his differences from the other apes and his inherent inadequacies. 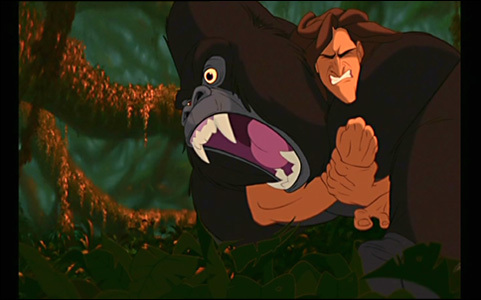 When Tarzan becomes an adult the tension between he and Kerchak, the leader of the gorilla troop, increases when Tarzan proves his superiority by killing Sabor the leopard, the gorillas' incessant antagonist. Tarzan's life suddenly changes when a group of white people enter his world and he discovers there are other creatures like himself. He is attracted to Jane, the daughter of Professor Porter, a scientist keen to study gorillas in the wild, and she is attracted to him. Clayton, a despicable white hunter who is acting as their guide, betrays the party and captures and imprisons Tarzan before returning to the jungle to capture the gorillas for zoo specimens. Tarzan escapes to protect the gorillas, Kerchak is killed defending his family and Tarzan battles Clayton to the death amongst the jungle creepers. 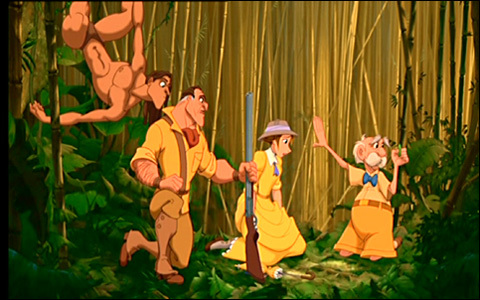 Both Jane and Professor Porter decide to stay in the jungle with Tarzan permanently.  The video clip about the Deep Canvas process was provided by Youtuber cookedart. Many thanks!